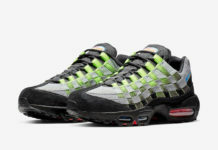 Following the return of the Nike Air Max 95 OG “Neon” release, comes this Nike Air Max 95 Ultra “Black/Volt” pair that is now arriving to retailers for the summer. This Nike Air Max 95 is another women’s exclusive colorway features a Black-based upper that is built with Hyperfuse. Other details includes Dark Grey hints and Volt accents that adds for a nice pop. Check out the detailed photos below and look for the latest Nike Air Max 95 Ultra “Black/Volt” available now at select Nike Sportswear retailers like SNS.